AKS Websoft Consulting is a pioneer when it comes to provide quality Internet Marketing and SEO Services in Delhi NCR. We believe in ethical and white hat approach which might take a bit longer time to rank a website to the top page of Google but once a website reaches there, it sustains at the top position for longer time. Our approach also helps to avoid penalties by major Google algorithmic updates like Panda and Penguin. We are not like any other SEO company who cons you by saying that they will deliver results within one month but you ended up paying for getting your website spammed and penalized by Google. 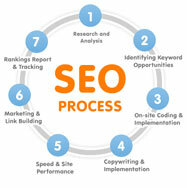 We build SEO strategies strictly according to Google Webmaster Guidelines. We have been working in SEO and Online Marketing industry for over 7 years and that is why we are well versed with all the changes and updates it has seen over the time. Our SEO experts have years of experience in getting websites to the top of SERP's. They know what works and what's not; have sound knowledge of the latest methodologies and current SEO trends. We also specialize in the other aspect of Search Engine Marketing which is Pay Per Click (Commonly known as PPC). Search Engine Optimization is the set of strategies and techniques used to increase number of visitors to a website by affecting its visibility in the organic rankings (non-paid) in the major search engines like Google, Bing, Yahoo and MSN. Today Search Engines have become the most effective medium to reach to the potential customers and provide them what they want. The whole process of SEO can be divided into two parts, one is On Page Optimization and the second is Off Page Optimization. In On Page we modify Title tag, Meta tags, Keyword Density, Site Structure and Headings to optimize them for certain keywords. In Off Page we acquire links from websites enjoying high authority and popularity in your niche. We offer tailor-made SEO packages to meet requirements of the clients and to provide then unmatched SEO Services at affordable price. Our SEO packages start at just INR 7000 ($150) per month and we provide you best SEO consultant in Delhi to establish your brand on Internet. AKS Websoft Consulting Pvt Ltd is the best SEO Company in Delhi, we have helped hundreds of our clients in acquiring new customers, generating leads and increasing revenues. We strive for excellence in whatever we do to drive targeted visitors to your website and covert them into customers.